Childrens METAL DETECTOR: Highly-sensitive, safe, and adjustable size! 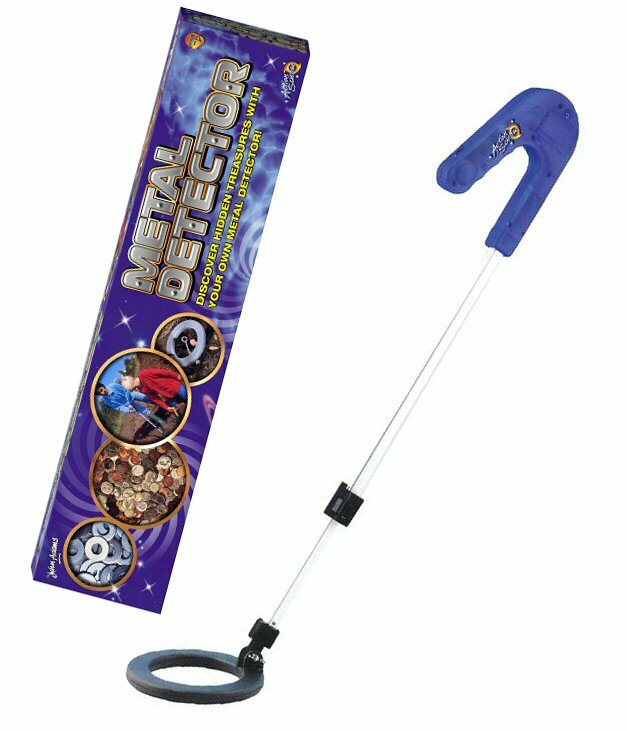 Our Metal Detector from the John Adams Action Science range of Science & Education learning toys makes an ideal gift for the more inquisitive child, encouraging learning through playing and sparking the imagination. Although classed as a toy, this is a real working metal detector. Older children may be ready for a high performance detector. We therefore recommend that you also visit our main metal detector section before making your decision - remember you can always call us up for further expert advice. Our children's metal detector uses sophisticated integrated circuits to detect metal below the surface of the ground. This is a real working metal detector and, while it is obviously not as powerful as the other metal detectors in our catalogue, it will enable your child to find things, generating a lot of excitement. Extendable, highly sensitive metal detector with electronic audible and visual warnings. Extends from 58-96 cm with adjustable search coil. Requires 1 x 9V battery, not included. Famous Scholars: Ernest Rutherford In 1895, JJ Thomson, discoverer of the electron, appointed a young Ernest Rutherford as one of his first graduate students at the Cavendish Laboratory. In 1898 Rutherford left Cambridge and spent the next twenty years establishing a world-class reputation with his pioneering work on the structure of the atom. In 1919 he was the obvious choice to take over from Thompson at the Cavendish, where he created an outstanding team of scientists who furthered his work in nuclear physics. Many groundbreaking discoveries emerged from the Cavendish under Rutherford's direction, in particular Chadwick's work on the neutron. In 1932, John Cockcroft and Ernest Walton first split the atom.